It seems you are using 3 palettes just for this basic scene: 1 for the grass (black + 3 greens), 1 for the ground (black + 3 browns) and 1 to connect the grass and the sky (black + 2 greens + cyan). That leaves only one palette left for everything else you might need to draw using the background. Also, since black is the background color, if you want to put something else in front of the sky (like mountains, rings, whatever) you'll have to waste one of the colors of this last palette with cyan, leaving only 2 colors to actually work with. Considering all of this, I think this setup might work for a demo or a couple of static screens, but wouldn't really work for a complete level in an actual game. In an actual game you'd probably have to go with 2-color grass and use cyan as the background color. Then you'll be able to use the browns for mountains and tree trunks and you'll still have 2 palettes left for other things. A palette with grays + white could be used for clouds, spikes and rocks, for example. Image appears to have vanished. Maybe save it as a PNG next time (not a BMP), and attach it here. It turns out I accidentally my entire pictures folder from my FTP server. Don't worry, it's back now. A palette update and some changes to the sky. EDIT: Also, too lazy to convert to PNG. Looks good! Pretty interesting way to blend the grass with the ground. I wonder if it would look good in slopes. The original Sonic the Hedgehog can use other colors besides black immediately below the grass. If you try to make slopes with your current palette setup it might end up looking blocky where the grass meets the ground, because you won't be able to draw the checkerboard pattern too close to the grass. Yes, but the original Sonic the Hedgehog was on Sega Genesis. I'm working with NES, which can't display as many colors at once as the Genesis. The Master System can display more colors per tile than NES, but not quite as many as Genesis. You might have better luck trying to emulate 8-bit Sonic. Hang on a moment while I try to see how well the gradient that I made here might work. Dithering out the "dark green" color let me cut it down to three palettes: sky and top of grass, grass and top of dirt, and solid dirt. This should allow drawing slopes with the grass and top of dirt palette as a transition. Which is precisely why I wondered how well slopes could be ported. I didn't assume they'd look bad, I think it might actually work! There are a few NES games that have slopes using different palettes from the ground under them and the resulting blockiness isn't particularly distracting. It will definitely look blockier than the 16-bit version, but that isn't necessarily bad. The Master System can display more colors per tile than NES, but not quite as many as Genesis. One Master System palette has as many colors as one Mega Drive palette, but the Master System only has 2 palettes while the Mega Drive has 4. You might have better luck trying to emulate 8-bit Sonic. 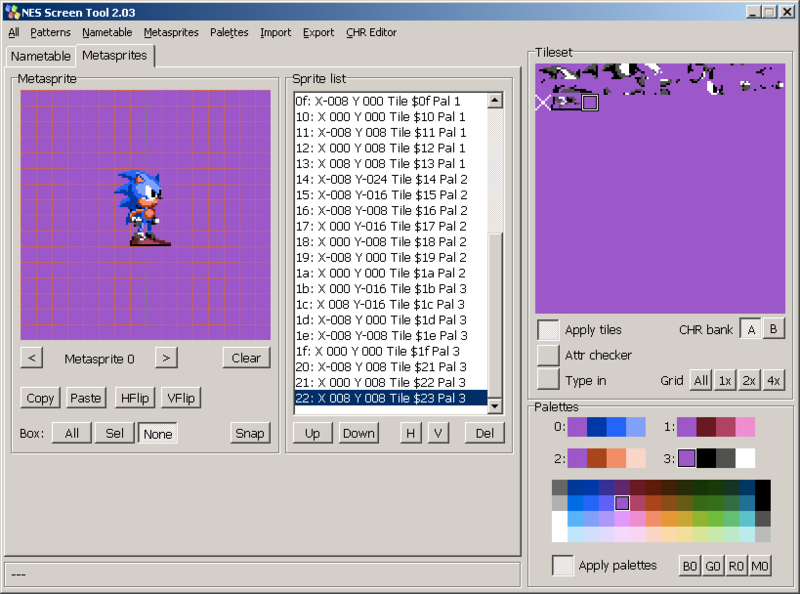 If you want to see how the 16-bit Green Hill might look on the Master System, you may be interested in checking out Sonic’s Edusoft. EDIT: tepples, your gradient looks pretty good in this shot. My goal with this was just to see if it could be done. Am I the only one to notice the incorrectly shaded checkerboard squares? You mean right under the grass? I believe the palettes are set up so that green and brown can't be in the same attribute area, so everything immediately below the grass must be black. I don't think it's very noticeable when the ground is straight as in this mock-up, but I did question how it would look on slopes, which would need far more black pixels. I think the complaint was that the light brown and pale brown shades in the bottom section should have been switched so that pale brown is below the dark brown and light brown is below the black. Oh, I see it now. The checkerboard pattern is definitely wrong.